On August 6, 2015 the Tri-County Drug and Gang Task Force (comprised of narcotics investigators from the Lunenburg County Sheriff’s Office, the Charlotte County Sheriff’s Office, and the Virginia State Police) along with the Charlotte County Sheriff’s Office, Lunenburg County Sheriff’s Office, and the Virginia State Police Bureau of Criminal Investigations conducted marijuana eradication operations in Charlotte County. The eradication program is part of the Governor’s Initiative against Narcotics Trafficking program (G.I.A.N.T.). The search resulted in the seizure of 117 marijuana plants valued at $351,000.00. As a result of this ongoing investigation charges are pending on two individuals. The task force has had several successful marijuana investigations for the 2015 growing season. The task force has seized 906 marijuana plants, over 10 pounds of processed marijuana, and 2 firearms in ongoing investigations. The task force and Sheriffs Townsend (Lunenburg) and Jones (Charlotte) encourages anyone with information on the distribution and/or manufacture of drugs to contact the Charlotte County Sheriff’s Office at (434) 542-5141, Lunenburg Crime Solvers at (434) 696-3100, Lunenburg County Sheriff’s Office at (434) 696-4452, or the Virginia State Police Drug Hotline at 1-800-553-DOPE (3673). On August 21, 2015 the Tri-County Drug and Gang Task Force (comprised of narcotics investigators from the Lunenburg County Sheriff’s Office, the Charlotte County Sheriff’s Office, and the Virginia State Police) conducted an investigation of an indoor marijuana manufacturing operation located in the Drakes Branch area of Charlotte County. The search resulted in the seizure of 8 marijuana plants valued at $24,000. The investigation is ongoing with charges pending on one individual. The task force and Sheriff Jones encourages anyone with information on the distribution and/or manufacture of drugs to contact the Charlotte County Sheriff’s Office at (434) 542-5141, Lunenburg Crime Solvers at (434) 696-3100, Lunenburg County Sheriff’s Office at (434) 696-4452, or the Virginia State Police Drug Hotline at 1-800-553-DOPE (3673). THE CHARLOTTE COUNTY SHERIFF’S OFFICE IS CURRENTLY INVESTIGATING MULTIPLE BREAK INS THAT HAPPENED IN THE KEYSVILLE, EUREKA AND ONTARIO AREAS OF CHARLOTTE COUNTY WITHIN THE LAST MONTH. 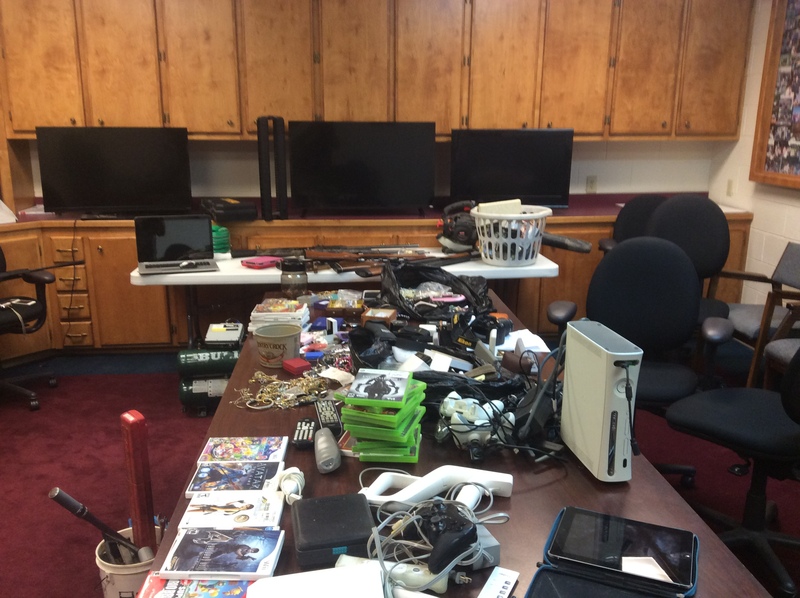 SOME OF THE BREAK INS AND LARCENYS HAVE NOT BEEN REPORTED TO THE SHERIFF’S OFFICE AND THERE WERE SEVERAL MORE BREAK INS IN PRINCE EDWARD COUNTY THAT ARE BEING INVESTIGATED. AT THIS TIME THE SHERIFF’S OFFICE HAS ITEMS RECOVERED FROM THESE BREAK INS LOCATED AT THE CHARLOTTE CO SHERIFF’S OFFICE. SOME HAVE NOT BEEN IDENTIFIED AT THIS TIME. THIS IS AN ONGOING INVESTIGATION AND IF ANYONE HAS ANY MISSING ITEMS YOU CAN CALL THE SHERIFF’S OFFICE AT 434-542-5141 AND MAKE ARRANGEMENTS WITH INVESTIGATIONS TO SEE THE ITEMS.